Sweet Dolly creates Blythe doll clothing & accessories. Nancy sews items for dolls including hats, socks, dresses, shirts, and skirts. She also takes special orders for items to be custom made according to the buyer's requests. 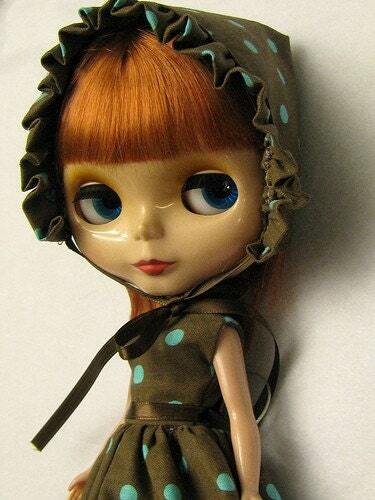 Sweet Dolly is a fresh, cute & sweet fashion for your Blythe. Tell me about how you originally got into your craft, Nancy. Sewing Blythe clothing began when I first discovered these big eyed beauties in 2007 while coming across Blythe's pictures on Flickr I quickly became attached to these dolls & their own little world of doll photography & doll fashion. Adding to my love for photography, Blythe has brought out more & more of my creative side each day I sit down with my ideas, fabric & sewing machine. My favorite thing to do in the whole wide world is travel. Seeing, living & tasting the world is the greatest learning experience for me. The part I enjoy best about traveling is being able to take my favorite bits of each place I visit, home with me through my camera. The biggest challenge in running my shop has been finding time to create all the ideas I have running through my head. Having a full time desk job takes away most of my time; I find myself jotting down notes or pattern ideas for doll clothing. You can find Post-Its of many colors with notes or sketches on, around and probably even under my desk at the office. I would love any of the clothing items as my Blythe family keeps growing, so does their wardrobe! The best part of Blythe is giving each one a persona and I'm loving do so through their clothing. Love bows & dots. When I was a kid I could never really decide what I wanted to be when I grew up, I just always knew it would be something that would let me be creative. Hopefully more free time to work on my own doll fashion designs and of course Travel. Visit Sweet Dolly at Etsy, and be sure to check out the sale section, updated monthly!